What did Rousseau express through works of art? Optional: On a small sheet of paper, draw animals to cut out and hide in the jungle. Reflect orally or in writing about the masterworks and student work. Create a 5” x 5” (12.7 x 12.7 cm) clay tile that reproduces a small segment of the original drawing. What did the artist draw and paint? What was the artist’s secret about his work? Use complete sentences to answer these questions. 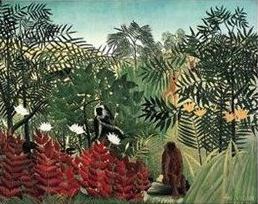 Tell one fact about Rousseau’s jungle artwork. What did you express through your artwork?